Spain's greatest master architect is by far Antoni Gaudi i Cornet and also the figurehead of Catalan Modernism in which his works reflect his highly individual and distintive style. His architecture and creative, unique buildings are all over Barcelona, but his "magnum opus" is the irrepressible church, La Sagrada Familia, on which construction was begun in 1882 and is still under construction today. 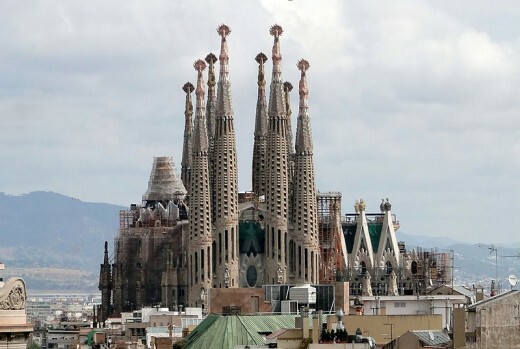 The projected date of completion on this magnificent church is not until 2026, the centennial of Gaudi's death. 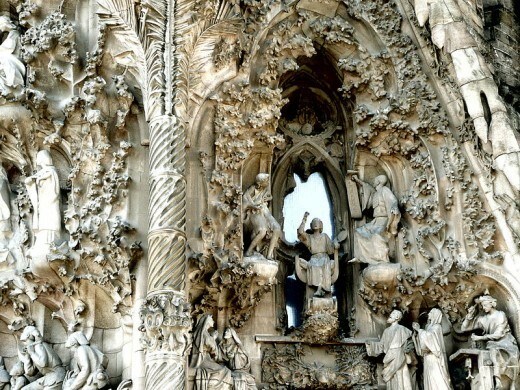 And in English we have coined the word "gaudy", meaning overly decorative, from Gaudi's name as his Sagrada Familia is so ornate and decorative. That such a great decorative and ornate church taking more than 100 years to complete should come from a man such as Gaudi, is a surprise, but at the same time a testament of his genius. Gaudi lead a quiet, reticent and reserved life because he suffered from poor health as a child, including severe rheumatism. 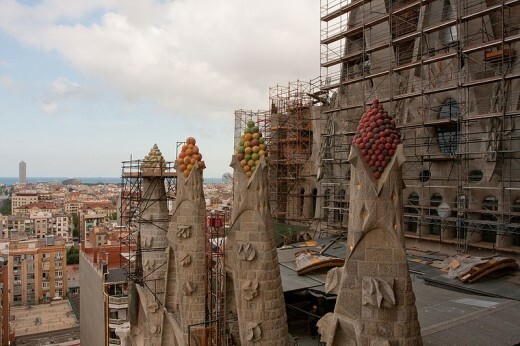 Because of his health problems, Gaudi became a vegetarian for most of his life. He also spent his entire life in Catalan and the Barcelona area, rarely leaving Spain or his beloved Catalan region. He studied architecture at Llotja School and Barcelona Higher School of Architecture graduating in 1878. To earn money for school he worked as a draftsman for various architects and constructors learning the trade and gaining experience on the job. He also studied French, history, economics, philosophy and aesthetics. He had a well-rounded education. He devoted his entire life to architecture and never married. He seemed to take refuge in the profound spiritual peace his Catholic faith offered him. Many times he was depicted as unsociable and unpleasant with gruff reactions and arrogant gestures, yet those close to him said he was friendly and polite to talk to and very faithful to his friends. After his death, there were hardly any written documents left behind by Gaudi, not even architectural drawings because he always prefered to create three dimensional models of his works before beginning construction. Because he rarely left the Catalan region, all his works are concentrated in the city of Barcelona, also the capital city of the Catalan region in Spain. His works represent his four life passions: architecture, nature, religion and love for the region of Catalonia. The early influence in his architecture was the neo-Gothic style and art and Oriental techniques. Then he became part of the Catalan Modernista movement which reached its peak in Barcelona in the late 19th century and early 20th century. Even then, his works transcended mainstreamn Modernisme, culminating in an organic style inspired by nature. Gaudi had widespread international appeal and there were many studies done at the time devoted to understanding his architecture. His masterpiece is, of course, La Sagrada Familia, one of the most visited monuments in Spain. 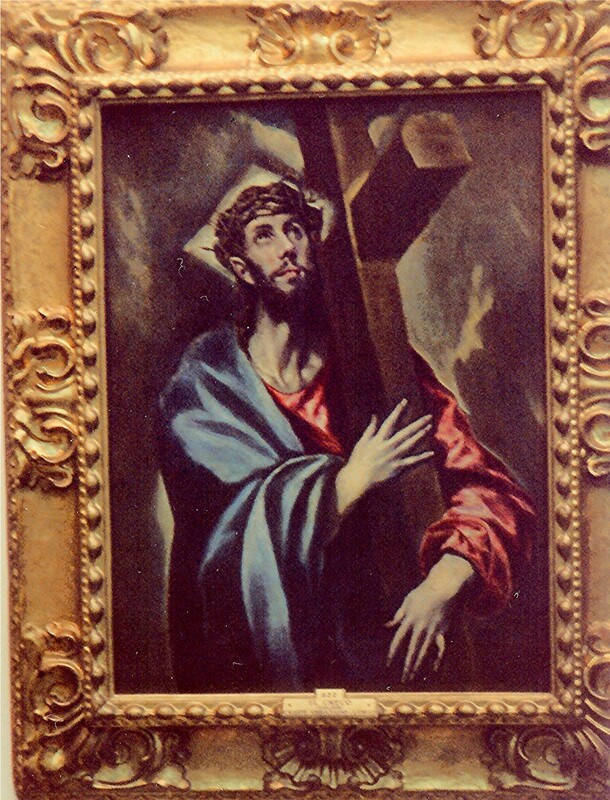 During his lifetime, his Roman Catholic faith intensified and religious images dominated his work. Because of this, he has been nicknamed, "God's Architect." He is so revered in Spain and Catalonia that there have been calls for his beatification, the first step in the process of becoming a saint in the Catholic Church. Gaudi always had a deep appreciation for Spain and great pride in his Mediterranean heritage and culture. He strongly believed Mediterranean people to be endowed with creativity, originality, and an innate sense of art and design. As a youth he spent much time outdoors and this gave him an opportunity to study nature, learn from nature's shapes and lines, and then to incorporate these into his architecture, especially into La Sagrada Familia. Although Gaudi is considered the great master of Catalan Modernism, his works really go beyond any one style or classification. He created imaginative works than find their inspiration in nature. Gaudi studied closely organic and an archaic geometic form of nature and searched for a way to give expression to them in his architecture. His study of nature developed into his use of ruled geometrical shapes such as the hyperbolic parabolid, hyperbolid, helicoid and the cone. All these reflect forms Gaudi found in nature. He discoved how to adapt the language of nature to structural forms of architecture and here in lies his genius. With the hyperbolic parabolid he was able to constantly vary the incidence of light. It allows for a hole in this space to let the natural light in. Of course, this complimented his organic vision of architecture with a unique spatial vision that allowed him to conceive his designs in three dimensions. This was the reason he built three dimension models and not architectural drawings of his building plans. Another element used by Gaudi was the catenary curve. He closely studied geometry and studied numerous articles about engineering and then fused the two together. Up until this time, the catenary curve had only been used in the construction of suspension bridges. For the first time, Gaudi used this element in common architecture. Gaudi uses catenary arches in the Sagrada Familia and it added great strength to his structure. The catenary arch distributes weight it regularly carries evenly and perfectly supports without the need for buttresses as required by the neo-Gothic style. He created a new arch style that was original, simple, practical and aesthetic. Gaudi reached his greatest architectural goal which was to go beyond the Gothic style. Spain's most magnificent and unusual modernist architect - Santiago Calatrava - is world-renowned. The inspiration for La Sagrada Familia originally came form a Catalan bookseller, Joseph Maria Bocabella. In 1872 he visited the Vatican in Rome and returned to Barcelona with the intention of building a church inspired by that at Loreto. He raised enough money to begin construction of the crypt of the church in 1882. The architect at the time was Francisco de Paula de Villar and the original architecture plan was for a Gothic revival church. 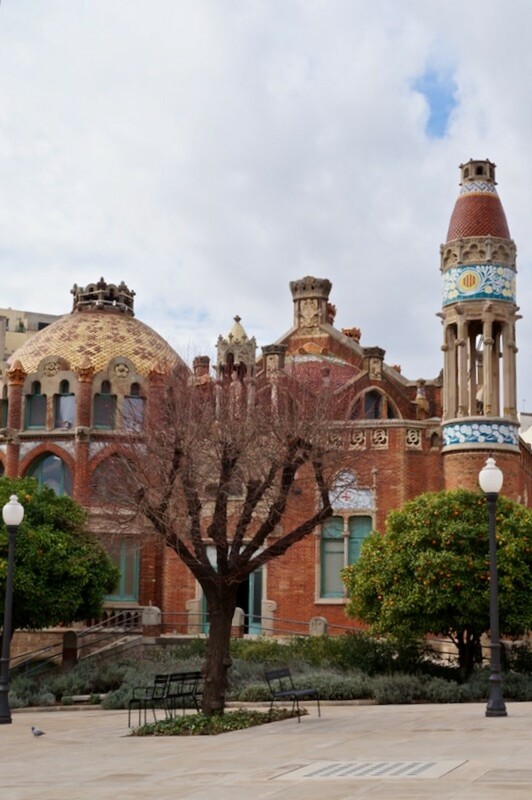 Antoni Gaudi became involved in the project in 1883 when Villar retired from the project. Gaudi assumed responsibility as the architect of the church and responsibility for its design which, of course, he changed radically. He took over the construction of La Sagrada Familia and transformed it with his architectural and engineering style combining Gothic and curvilinear Art Nouveau forms. When Gaudi died in 1926 less than a quarter of the construction had been completed. 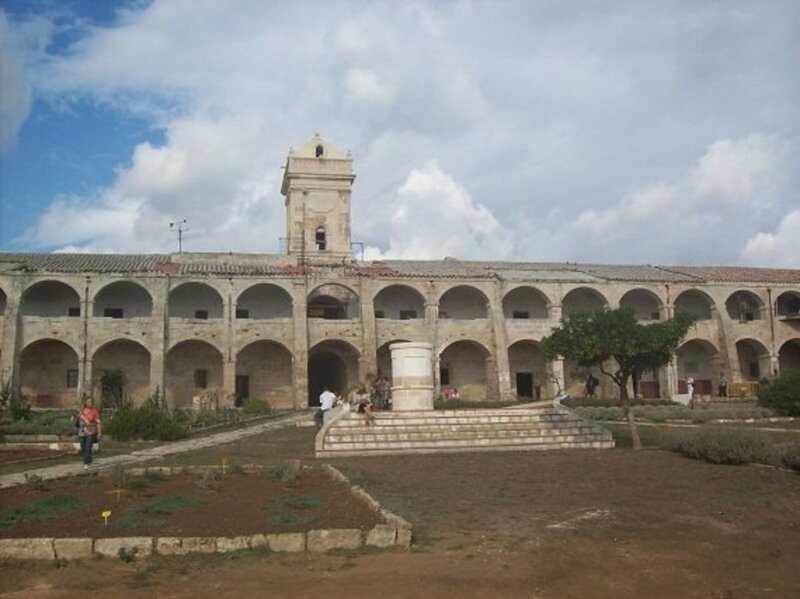 Construction of the church went slowly because of the continuation of having to raise money, and the construction was interrupted by the Spanish Civil War (1934-1939). Construction really slowed during the dictatorship of Francisco Franco who did not die untiil 1975. Today, the present design is based on reconstructed versions of the best plans as well as modern adaptions. Computer-aided design technology has been used to accelerate construction. The central nave vaulting was completed in 2000 and builders are now constructing the transept vaults and apse. There are calls for eighteen spires total in La Sagrada Familia. Each spire represents in ascending order of height the 12 aposltes, 4 evangelists, the Virgin Mary and Jesus Christ (the tallest spire) As of 2010, eight spires have been built. The Nativity Facade facing the East - bears the most direct Gaudi influence and finished before work was interrupted in 1935. The Passion Facade facing the West - especially striking for the spare, gaunt, tormented characters it depicts. The Glory Facade facing the South - construction began in 2002 and will be the largest and most monumental of the three. It represents one's assension to God. The Nativity Facade was constructed first by Gaudi between 1894 and 1930. It was the first to be completed and is dedicated to the birth of Christ. Gaudi knew he would never live to see this church completed, so he began here first as this is the most ornately decorated of the three facades. This is the facade that most characterizes and captures Gaudi's naturalistic style. The sculptures are ornately arranged and decorated with scenes and images from nature - each a symbol in their own manner. At the base of the columns of the facade are two carved turtles - one representing land and the other the sea. They are symbols of time as something set in stone and unchangeable. Two chameleonns can be found on either side of the facade symbolizing change. Gaudi chose this facade to embody the structure and decoration of the whole church. 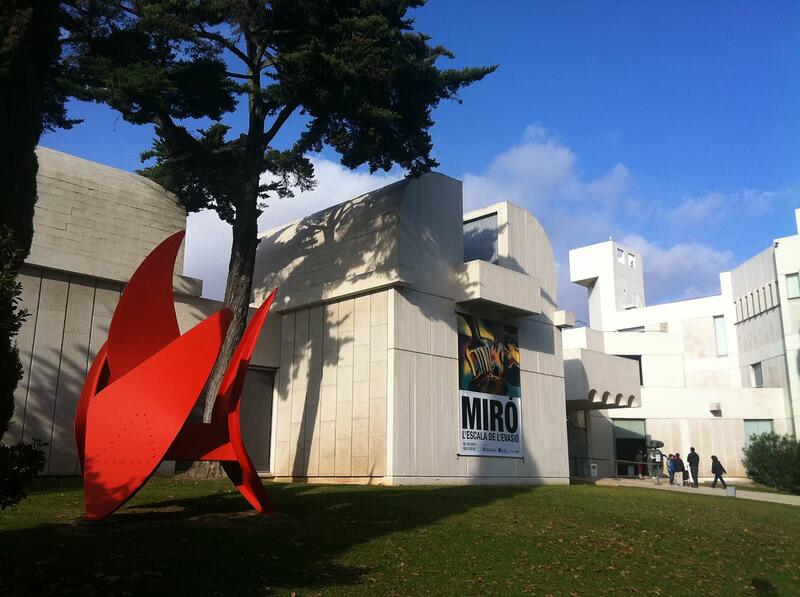 This facade is the most attractive and most accessible to the public and is highly decorative and beautiful. Although La Sagrada Familia started out as just a Roman Catholic Church, in November of 2010 it was consecrated and proclaimed a minor basilica by Pople Benedict XVI. Although it is uncompleted, it has also been named a UNESCO World Heritage Site. Despite his grand architectural reputation, Antoni Gaudi died a remarkably, nearly unknown death. In June 1926, he was taking his daily walk to Sant Felip Neri Church for prayer and confession when he was struck by a tram and lay unconscious on the street. He was assumed to be a beggar by passerbys because of the shabbily way he was dressed that day and by the lack of any identity documents on his person. Therefore, he did not receive immediate aide. Gaudi was not recognized by anyone until the next day, and therefore only had rudimentary care in the hospital once he was taken there. By that time, his condition had so deteriorated that he quietly passed away at the age of 73 and was buried two days later. Quite an inauspisious ending for the architect of the most magnificent church in all of Spain. 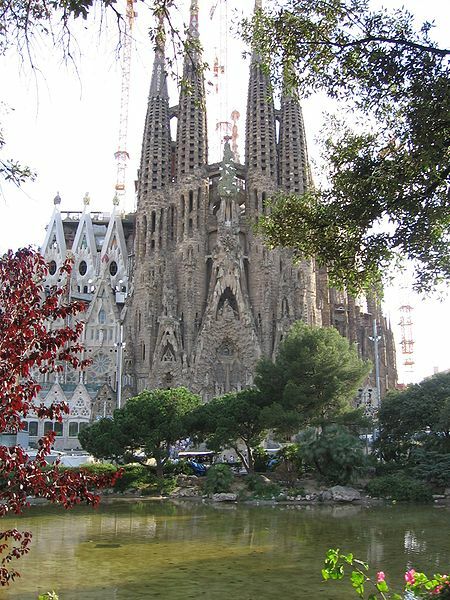 10 interesting facts about the Sagrada Familia in Barcelona, Spain. Bloody Island Menorca: What's All This About Then? Oh my gosh! 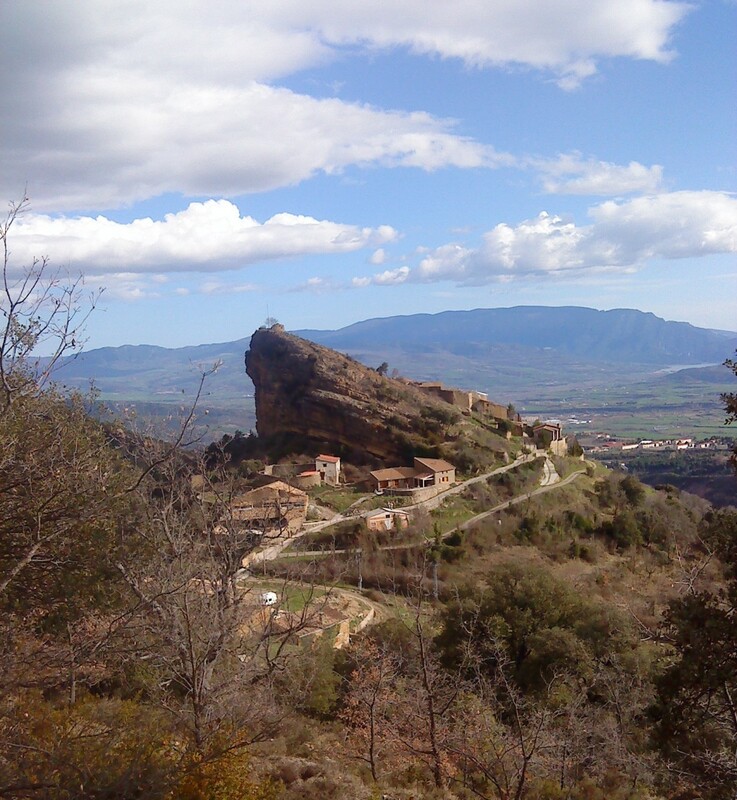 This is 'the jewel' in all of Spain. Don't miss this if you are ever in Barcelona. It is magnificent and I don't think it is projected to be finished until 2020 or 2025. It is taking more than a century to complete this cathedral. The detail is incredible. I love architecture (we have architects in the family) and so I wanted to share this beautiful cathedral on HP. Very cool! I never knew about this but it is fantastic! It's definitely one of the most (if not *the* most) wonderful and inspiring place of worship in the world. Such an in depth article, thank you. I hope you do see Barcelona. It is an artist's treasure. There is so much art there to see and Gaudi's works are magnificent. The homes and buildings he built are fabulous and of course Parc Guell. But, the Sagrada Familia is the best by far. Gaudi was so creative and unique, I thought he certainly deserves as article! Thanks so much for stopping by to read and comment. I enjoyed your comments. Thank you! 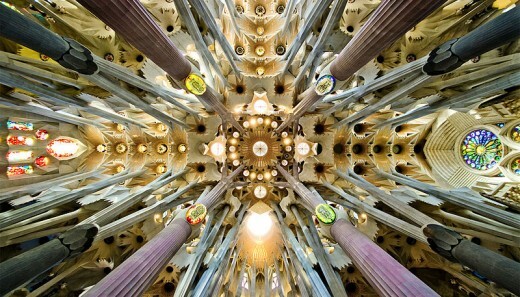 What a wonderful article suzettenaples, I am a huge Gaudi fan and have been for many years. As an artist I have admired his creativity and imagination shown in his many works and look forward to seeing in person some day soon! Thanks for sharing and giving this amazing talent the tribute he deserves. Voting up up up! Mhatter99: Thank you! and you are most welcome! I have watched La Sagrada Familia being built over the years. I saw it for the first time in the 1990's and the last time in 2007. It has come a long way since my first viewing of it. I was awed by how large it is and the inticate detail and ornate decorations. It truly is magnificent and I had to finally write something about it.